What a doozy of a day so far. I had to wake Ben up about 15 minutes before we needed to leave to get him to daycare on time so he was too grouchy to eat breakfast & was in a true snit by the time I dropped him off. I've always been very lucky with his love of daycare - he's never been a crier or needed to cling to me but today he was a MESS. I was a little worried but I stuck around for a while (a huge thank you to the lovely ladies in the office for offering to hang on to Evan while I gave Ben some extra time) & eventually his teachers were able to convince him to play with a car. That boy is such a gorgeous thing. I hate to say this but I don't mind when he's a mess like that or heaven forbid he gets sick because those are the time he lets me just hold him close & he clings to me like there's no one else in the world. Benny gives the best hugs. Pretty sure it's safe to say that it's the new Big Boy Bed that did him in. It takes him a good hour or two to go to sleep at night now because he is taking advantage of the freedom his new bed allows. He is up & down & up & down about a million times before he finally passes out. Usually on the floor, surrounded by toys, so we could have just saved a little money & thrown a pillow on the ground instead. Ah well, you live & you learn! He is hysterical when he's sneaking around outside of his bed, let me tell you. Again, I shouldn't admit this because I am supposed to be a firm disciplining parent but there is nothing funnier to me than the startled look on his face when we "catch" him out of bed - a split second of eye contact sends him scurrying like a cockroach back to bed. He is not the quietest child on earth so we are aware of every move he's making in his bedroom & every few minutes we see his little head peek around a corner at us then dart back in for more mischief. It should frustrate us but all of our energy goes into not letting him see us laughing so it's all good. Anyway, back to today. I got caught in the most torrential downpour at the mall this morning. When I came out of the shops I was surprised to see it raining. Shouldn't be surprised since it's done nothing but rain all summer but I was caught off guard. Still, I figured I had my umbrella because I carry the biggest bag on earth & refuse to leave anything at home. So I put the hood up on Evan's pram, put the umbrella over that & off we go - my hair was already a wavy mess, it couldn't get worse. OH. MY. WORD. We were about halfway to our car when the heavens opened up & let loose on us. I managed to keep Evan mostly covered with my umbrella balancing skills but by the time we finally got to the car (I park far away so I get a tiny bit more exercise), got him buckled in, got the bags in, the pram away & poured myself into the driver's seat, it was like I had been sitting front row at the Shamu show at Sea World. I've done that, by the way, and it was very bad. Now we're home, Evan is sound asleep across my lap while I am trying to decide what to make for dinner tonight before we hit the grocery store. I have speech class so whatever I make Marcel will have to enjoy without me & while entertaining the crazy children. I should have planned better & had the groceries delivered today but I just couldn't get my act together. Now that I'm eating much better, I have to get groceries more often because the veggies & fruit disappear fairly quickly. I don't think we have meals that don't involve veggies anymore so it's a good thing but I do hate going to the bloody grocery store with even just one kid - tears are inevitable. So this is a boring post & I am sorry about that. Some days I get to rambling & can't stop. Oh! Here's the card I got Marcel for Valentine's Day - so freaking gorgeous & simple, I love it madly. 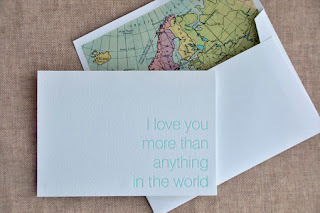 I try to make an effort to buy Australian-made artsy fartsy goodness when I can because I love to support the local artists that rock this corner of the world (I will do the same wherever we live next, I'm sure) so I urge you to check out Peace, Love & Letterpress.